Birding Is Fun! : It's Christmas Bird Count time again! The Christmas Bird Count season is probably my second favorite time of the year for birding. I enjoy getting out with fellow birders that I haven't seen since this same time last year. It is also cool to get out into areas that seldom get birded. I have gotten quite a few lifers on CBCs in the past. I remember being shown my first Northern Saw-whet Owl. I also remember seeing my first Lapland Longspurs only a few miles from my house. 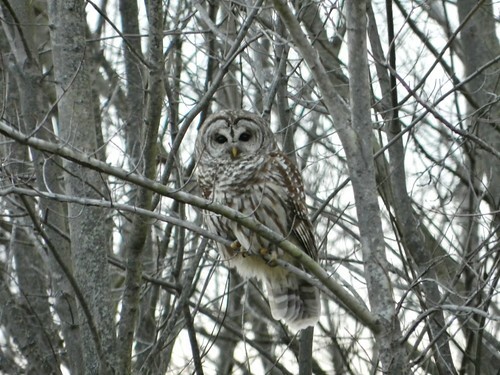 My first up-close view of a Barred Owl occurred while I was CBCing. I remember the bird looking down at me to this day. These are experiences I will never forget. 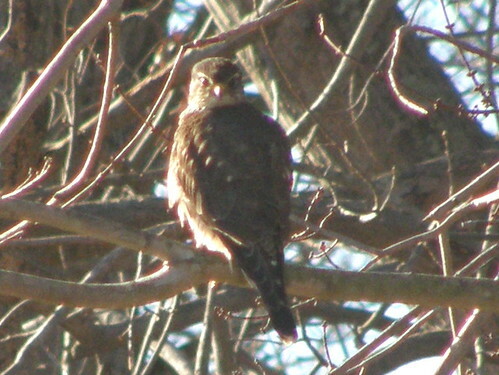 For the last few years, I seem to always get a Merlin on a count. I very seldom see them otherwise. I will take a Merlin anytime! I feel very fortunate and privileged to have been able to learn from a great deal of talented expert birders in the past. These birding "mentors" have played a significant role in shaping my birding ability. When I first started birding, I would go to the CBC tallies and wonder in awe at how the same birders would always find the "good" birds. At first, I thought that it may have just been that they are in the right spots at the right times. However, having been able to bird with them a few times, I found that it wasn't that simple. Most birders start out by pouring over field guides in order to become a better birder. I tried that route, but I found that this alone doesn't make one a "better" birder. It is all about experience. If you know of birders that always seem to find the "good" birds, just follow them around for a while and watch how they bird. Ask them questions about how they do their thing. Unfortunately, I am only able to do a couple of CBCs a season. It is definitly my second favorite time of the year to get out, as you never know what you might find lurking in never birded areas. 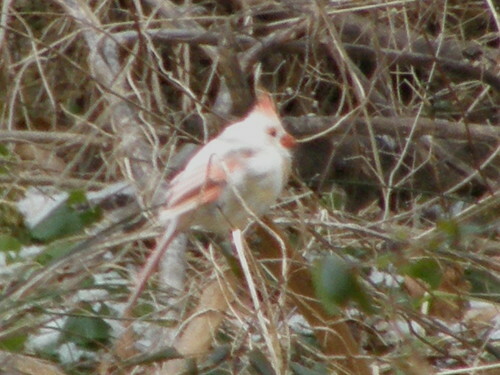 Below is a photo of a leucistic Northern Cardinal I found on a CBC a few years ago. So go help put the birds on the map and get out there and have fun! great post Donald, i really need to start doing this too, would be a good way to keep the birding juices flowing in winter other than watching the feeders. i'm pretty sure I've shown you this before but spotting my lil' leusistic cardinal was a very proud day. He hung out in my backyard all winter. I'm embarrassed to confess that I've only done one Christmas Bird Count. It was a blast. It's just hard for me to dedicate an entire day to things when I have so many other responsibilities. Maybe I can still sneak in a CBC this year. To date, I have not participated in a Christmas Bird Count but reading this wonderful post has certainly peaked my interest. If only I could find the time ... It sounds like you have had some wonderful sightings during these get togethers. Love the terrific Barred Owl image! Sounds like you're enjoying birding. I enjoy seeing birds in the wild, too. But I don't have too much knowledge about it. I did one in Cocoa this past Saturday. It was a lot of fun, a great learning experience, and I highly recommend it. Thanks.